I’m not the type of person who thinks that I need a custom controller. We’ve done a bunch of reviews for brands like SCUF that have paddles on the back and other crazy features to help the pro gaming scene, but I’m comfortable with my standard controller. I felt like games are designed with the standard controller in mind and I didn’t need any fancy extra features. At least I felt that way until I sat down with the brothers behind Evil Controllers. These sharp and talented minds are doing more than checking boxes and adding bullet points. They are creating the natural evolution of the controller. Think back to early game controllers. A directional pad, and the A and B buttons. We didn’t need much more for control of simpler games in a simpler time. Over time, as our need for additional control inputs in games has evolved, so have our controllers. The current DualShock 4 has 18 buttons (more if you count the ability to use the touchpad in sections) in addition to the dual analog sticks. That’s natural evolution, and today’s games would be impossible to play without every one of those inputs. The issue is that our controllers have plateaued — in more ways than button amount — and with that plateau comes a limitation on what our games can do. 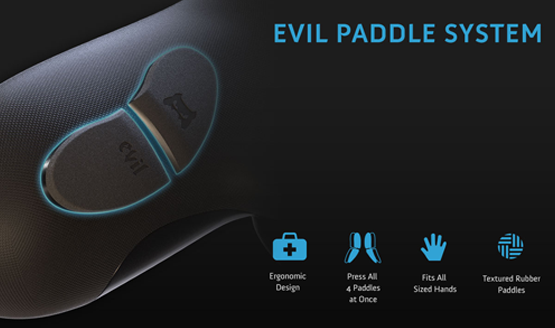 Evil Controllers is looking not at the controller’s feature set, but at what gamers need from their controller. They painstakingly engineer every little part of the controller, testing, re-testing, and testing again until they come to the perfect controller. Then they release it, take feedback, and start the process all over again. Many pro controllers tout their paddles, extra inputs that can be remapped to any other controller input, placed either directly on the back or on the grips. 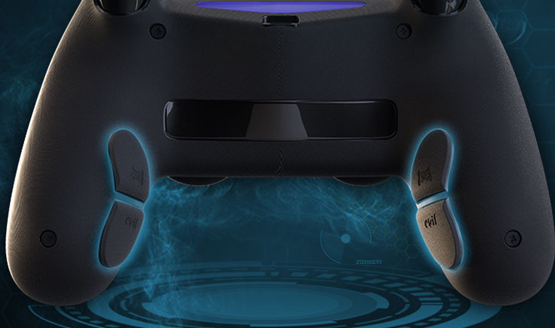 While they may give an edge by allowing you to keep your thumbs on the analog sticks, these paddles are often poorly designed, unable to be pressed from any angle, requiring precise and relatively uncomfortable position by your fingers. Pro controllers too often just feel… unnatural. The Evil Shift makes the paddles into buttons that feel just like the contours of the shoulder buttons. Simply put, they feel a natural part of the controller. They also sit right underneath where your fingers already go, meaning that you don’t hold the controller any differently than you would a regular DualShock 4. It’s not just the paddles that have been iterated. The face buttons have been shaved down to a three millimeter, high response button, so the button press feels quicker and more responsive than a standard controller. The triggers are on a hairpin to allow quick firing with the edge of your finger and using the full analog response of the trigger if you do need to press it fully. The thumbsticks are interchangeable with three different lengths, popping on and off easily to fulfill different needs, as well as being tightened so that there is no kickback when you let go of the stick. Instead of overshooting to the other side, the stick returns to the middle and stays there. All of that doesn’t even take into account the easily remappable paddles and the 15 different profiles that you can save directly to the controller. These elements come together to create a controller that still feels like the DualShock 4 we know and love but solves some key issues that our current controllers have. If we want our games to evolve, then our controllers have to evolve. If we want our controllers to evolve, then custom and new controller designs have to remain comfortable and accessible to everyone. Evil Controllers isn’t content just checking off those boxes to give pro gamers what they need. They want to advance the idea of the controller at such a fundamental level that we may just see their designs become the basis for the future of the gaming controller. The Evil Shift will be available later this year. If you want to learn more about the Evil Shift, you can visit Evil Controllers’ site. There will be both PS4 and Xbox One versions. Check out all of our E3 2017 coverage.